Objectives: After organ transplant, strategies to simplify the therapeutic regimen may improve adherence and prevent rejection and/or graft loss. The aim of the present study was to evaluate the safety of conversion from once-daily prolonged-release tacrolimus (Advagraf; Astellas Pharma Europe Limited, Middlesex, UK) to once-daily extended-release tacrolimus (Envarsus; Chiesi SAS, Nanterre, France) in stable adult liver transplant recipients. Materials and Methods: This observational study inclu-ded 44 liver transplant patients (median age of 59 y; 63.6% men; median delay after transplant of 72.5 mo). Conversion was based on a 1:0.70 proportion. Results: Mean dose of tacrolimus was 2.65 ± 1.24 mg/day before conversion and 2.09 ± 1.68 mg/day after conversion (P < .05), with ratio of 1:0.79. Mean serum tacrolimus trough level increased after conversion (4.92 ± 1.65 vs 5.60 ± 2.89 ng/mL; P < .05), with ratio of 1:1.14. 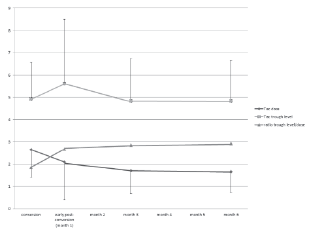 Six months after conversion, mean dose of tacrolimus was 1.65 ± 0.93 mg/day (ratio of 1:0.62) and mean serum tacrolimus trough level was 4.82 ± 1.85 ng/mL, similar to the initial level before conversion. At the end of follow-up, 2 patients had returned to once-daily prolonged-release tacrolimus because of adverse effects (allergy, digestive trouble), which resolved thereafter. The mean cost of tacrolimus therapy was 5.54 ± 2.29 Euros/patient/day before conversion and 4.11 ± 2.32 Euros/patient/day after conversion (P < .05). Conclusions: Conversion from prolonged-release to extended-release tacrolimus in stable liver transplant patients is safe and cost-effective; however, initially, dose adaptations and careful monitoring are required. Immunosuppressive regimens after liver transplant (LT) are based on a calcineurin inhibitor, (either cyclosporine or tacrolimus).1 Tacrolimus became first available as an immediate-release formulation (IR-Tac) administered twice daily (Prograf; Astellas Pharma Europe Limited, Middlesex, UK). Two formulations of tacrolimus have been developed to be administered once daily: a prolonged-release (PR-Tac) formulation (Advagraf; Astellas Pharma Europe Limited) and more recently an extended-release (ER-Tac) formulation (Envarsus; Chiesi SAS, Nanterre, France). Conversion from twice-daily to once-daily tacrolimus has been studied in maintenance LT recipients, using either PR-Tac or ER-Tac.2-5 These studies demonstrated that pharmacokinetics of twice-daily tacrolimus and the 2 formulations of once-daily tacrolimus are significantly different. Because no such data are available to date, the aim of the present study was to analyze the impact of conversion in daily practice from PR-Tac to ER-Tac among a large cohort of stable LT recipients, especially with regard to pharmacokinetics, safety, and cost. This was a single center study conducted in adult LT patients. We performed a retrospective analysis of our cohort of patients, based on prospectively recorded clinical charts. Inclusion criteria were as follows: at least 6 months of posttransplant follow-up and no acute rejection episodes in the previous 3 months. Conversion from PR-Tac to ER-Tac was based on a 1:0.7 proportion (but eventually adapted to available formulations of ER-Tac; ie, 0.75, 1, and 4 mg) and then modified on the basis of serum levels or adverse effects. Tacrolimus was taken in the morning, 1 hour before or 2 hours after breakfast, as recommended by the manufacturers. Doses and serum trough levels of tacrolimus and liver and renal function were recorded on the day of conversion, every 2 weeks for 2 months, and at 3 and 6 months after conversion (serum trough level was recorded usually every 3-6 months in maintenance patients before conversion). In addition, rejection episodes, arterial hypertension, dyslipidemia, and diabetes mellitus were assessed during the routine follow-up. Adverse effects were also recorded. Conversion was performed after patients gave their informed consent (both formulations are approved in France). The aim of conversion was to reduce the cost of tacrolimus therapy, according to the French Public Health recommendations. Cost of tacrolimus therapy was based on the French official cost as of July 2016 (62.90 Euros for 30 × 1 mg for Advagraf and 74.79 Euros for 30 × 1 mg for Envarsus). Renal function was measured as glomerular filtration rate, estimated by the simplified Modifi-cation of Diet in Renal Disease formula. Arterial hypertension was defined as blood pressure > 140/90 mm Hg at the 2 following visits or when an antihypertension treatment was used. Dyslipidemia was defined as hypercholesterolemia > 220 mg/dL and hypertriglyceridemia > 200 mg/dL at the 2 following visits or when a hypolipidemic treatment was used. Diabetes mellitus was defined as fasting plasma glucose > 126 mg/dL at the 2 following visits or when a hypoglycemic treatment was used. Rejection was defined according to the BANFF criteria6 on liver biopsy. Quantitative variables were described using mean, median, range, and standard deviation. Categorical values were tabulated, and percentages were calculated. Quantitative variables were compared using t test (for repeated measures) and considered significant at P < .05. Between October 2015 and November 2015, 44 patients (28 men and 16 women) with median age of 59 years (range, 37-74 y) were enrolled in the study after a median interval of 72.5 months (range, 6-333 months) after LT. Alcoholic cirrhosis was the main indication for LT. Immunosuppressive therapy at the time of conversion consisted of tacrolimus alone in 20 patients or tacrolimus with mycophenolate mofetil in 24 patients (with steroids in 4 patients). Preconversion mean tacrolimus trough level was 4.92 ± 1.65 ng/mL, with a daily dose of 2.65 ± 1.24 mg. Patient characteristics are summarized in Table 1. To the best of our knowledge, patients were not taking drugs that could interact with tacrolimus. Mean dose of tacrolimus was 2.65 ± 1.24 mg/day before conversion and 2.09 ± 1.68 mg/day after conversion (P < .05), with ratio of 1:0.79. Mean serum tacrolimus trough level increased after conversion (preconversion level of 4.92 ± 1.65 ng/mL vs postconversion level at 1 mo of 5.60 ± 2.89 ng/mL; P < .05), with ratio of 1:1.14. Three months after conver-sion, mean dose of tacrolimus was 1.69 ± 1.01 mg/day and mean serum tacrolimus trough level was 4.82 ± 1.91 ng/mL, similar to initial levels before conversion (P = .68) (Figure 1). At 6 months after conversion, mean dose of tacrolimus was 1.65 ± 0.93 mg/day and mean serum tacrolimus trough level was 4.82 ± 1.85 ng/mL, similar to initial levels before conversion (P = .71) (Figure 1). Finally, the dose ratio for similar tacrolimus exposition was 1:0.62. At the end of the 6-month follow-up, 1 patient died (from suicide), 41 patients were still on ER-Tac, and 2 patients had returned to PR-Tac because of adverse effects (allergy, digestive trouble), which resolved thereafter. Aspartate and alanine transaminase and gamma-glutamyl transpeptidase levels remained stable between conversion and end of follow-up (29 ± 30, 31 ± 30, and 107 ± 191 IU/L vs 30 ± 30 [P = .87], 26 ± 17 [P = .55], and 112 ± 287 [P = .72] IU/L, respectively). Initial estimated glomerular filtration rate was 62.60 ± 21.51 mL/min versus 62.25 ± 22.00 mL/min 6 months after conversion (P = .67). No biopsy-proven acute rejection was observed during the follow-up period of 6 months after conversion. At the end of the follow-up, no differences (P > .99) were observed in the prevalence of arterial hypertension (34 patients, 77.3%). The prevalence of diabetes mellitus and dyslipidemia also remained unchanged (both P > .99) after conversion (17 patients/38.6% for diabetes mellitus and 15 patients/34.1% for dyslipidemia). The mean cost of tacrolimus therapy was 5.54 ± 2.29 Euros/patient/day before conversion and 4.11 ± 2.32 Euros/patient/day (ratio of 1:0.74) 6 months after conversion (P < .05). Presently, only scarce clinical data are available in LT recipients, which have mainly focused on pharmacokinetic data. Alloway and colleagues, in a phase 2 study, studied the conversion from Prograf to Envarsus in adult stable LT patients.4 The mean conversion ratio was 0.71, and pharmacokinetics data demonstrated consistent exposure at this conversion dose. Maximum concentration, maximum-to-minimum concentration ratio, percent fluctuation, and swing were significantly lower and time of maximum concentration was significantly longer for Envarsus. To date, there have been few direct pharmacokinetic comparisons of the 2 once-daily formulations of tacrolimus (Advagraf and Envarsus) in solid-organ transplant recipients. Recently, Tremblay and colleagues compared all 3 formulations of tacrolimus (IR-Tac, PR-Tac, and ER-Tac) in 30 stable renal transplant recipients.20 Patients were dosed with each drug for 7 days, and blood samples were obtained over 24 hours. A conversion factor of 1:1:0.80 for IR-Tac:PR-Tac:ER-Tac was used; no dose adjustments were permitted during the study. The observed exposure of IR-Tac was used to normalize exposure for PR-Tac and ER-Tac, resulting in the following recommended total daily dose conversion rates: IR-Tac:PR-Tac, +8%; IR-Tac:ER-Tac, -30%; and PR-Tac:ER-Tac, -36%. In the present study, we confirmed that a quite similar reduction dose (38%) is needed in cases of conversion from PR-Tac to ER-Tac in adult stable LT patients. We experienced some delay for obtaining the right conversion dose ratio because of the few available formulations of ER-Tac (0.75, 1, and 4 mg); therefore, it was difficult to use in patients who received low doses of tacrolimus. Finally, the conversion led to a significant reduced cost of tacrolimus therapy in our study (26%). Nevertheless, it must be pointed out that initial close drug monitoring to adapt the dose of ER-Tac after conversion induced additional costs. In our experience, a new steady state was obtained rapidly, less than 3 months after conversion. Despite a short follow-up, we found no reported concerns regarding adverse events after conversion (only 2 patients presented minimal adverse events [allergy and digestive trouble], probably related to excipient or changes in pharmacokinetics of the drugs). We observed no cases of biopsy-proven acute rejection in our 44 patients. Nevertheless, it can be hypothesized that this may have been unde-restimated in the absence of protocol liver biopsies. We did not find a significantly increased risk of arterial hypertension, hypercholesterolemia, or diabetes mellitus in our cohort. Liver function tests remained unchanged in our patients, and we did not observe significant renal function variation. Because available data strongly support that once-daily tacrolimus is therapeutically equivalent to the twice-daily formulation, with similar adverse effects, the question remains of its potential benefits in daily practice. As discussed above, improved adherence was strongly suggested. In addition, reduced frequency of dosing may have also benefitted the health-related quality of life in our patients. Finally, the 2 formulations of once-daily tacrolimus are different (tablets or capsules), and this could also affect patients’ preferences. Some observa-tional studies evaluating this point are ongoing. In conclusion, our results, from the first available cohort of solid-organ transplant recipients, indicate that conversion from once-daily PR-Tac (Advagraf) to once-daily ER-Tac (Envarsus) in stable LT patients is safe and cost-effective; however, initial dose adaptations and careful monitoring are still required. 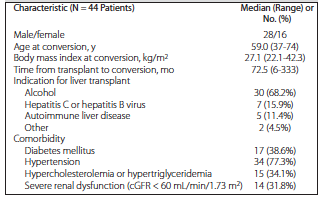 Conti F, Morelon E, Calmus Y. Immunosuppressive therapy in liver transplantation. J Hepatol. 2003;39(5):664-678. Florman S, Alloway R, Kalayoglu M, et al. Conversion of stable liver transplant recipients from a twice-daily Prograf-based regimen to a once-daily modified release tacrolimus-based regimen. Transplant Proc. 2005;37(2):1211-1213. Florman S, Alloway R, Kalayoglu M, et al. Once-daily tacrolimus extended release formulation: experience at 2 years postconversion from a Prograf-based regimen in stable liver transplant recipients. Transplantation. 2007;83(12):1639-1642. Alloway RR, Eckhoff DE, Washburn WK, Teperman LW. Conversion from twice daily tacrolimus capsules to once daily extended-release tacrolimus (LCP-Tacro): phase 2 trial of stable liver transplant recipients. Liver Transpl. 2014;20(5):564-575. Sanko-Resmer J, Boillot O, Wolf P, Thorburn D. Renal function, efficacy and safety postconversion from twice- to once-daily tacrolimus in stable liver recipients: an open-label multicenter study. Transpl Int. 2012;25(3):283-293. Demetris A, Adams D, Bellamy C, et al. Update of the International Banff Schema for Liver Allograft Rejection: working recommendations for the histopathologic staging and reporting of chronic rejection. An International Panel. Hepatology. 2000;31(3):792-799. Kim WR, Lake JR, Smith JM, et al. OPTN/SRTR 2013 Annual Data Report: liver. Am J Transplant. 2015;15 Suppl 2:1-28. Butler JA, Roderick P, Mullee M, Mason JC, Peveler RC. Frequency and impact of nonadherence to immunosuppressants after renal transplantation: a systematic review. Transplantation. 2004;77(5):769-776. Denhaerynck K, Dobbels F, Cleemput I, et al. Prevalence, consequences, and determinants of nonadherence in adult renal transplant patients: a literature review. Transpl Int. 2005;18(10):1121-1133. Barraclough KA, Isbel NM, Johnson DW, Campbell SB, Staatz CE. Once- versus twice-daily tacrolimus: are the formulations truly equivalent? Drugs. 2011;71(12):1561-1577. Trunecka P, Boillot O, Seehofer D, et al. Once-daily prolonged-release tacrolimus (ADVAGRAF) versus twice-daily tacrolimus (PROGRAF) in liver transplantation. Am J Transplant. 2010;10(10):2313-2323. Dumortier J, Guillaud O, Boillot O. Conversion from twice daily tacrolimus to once daily tacrolimus in long-term stable liver transplant recipients: a single-center experience with 394 patients. Liver Transpl. 2013;19(5):529-533. Fischer L, Trunecka P, Gridelli B, et al. Pharmacokinetics for once-daily versus twice-daily tacrolimus formulations in de novo liver transplantation: a randomized, open-label trial. Liver Transpl. 2011;17(2):167-177. Kuypers DR, Peeters PC, Sennesael JJ, et al. Improved adherence to tacrolimus once-daily formulation in renal recipients: a randomized controlled trial using electronic monitoring. Transplantation. 2013;95(2):333-340. Dharancy S, Giral M, Tetaz R, Fatras M, Dubel L, Pageaux GP. Adherence with immunosuppressive treatment after transplantation: results from the French trial PREDICT. Clin Transplant. 2012;26(3):E293-299. Burra P, Germani G, Gnoato F, et al. Adherence in liver transplant recipients. Liver Transpl. 2011;17(7):760-770. Adam R, Karam V, Delvart V, et al. Improved survival in liver transplant recipients receiving prolonged-release tacrolimus in the European Liver Transplant Registry. Am J Transplant. 2015;15(5):1267-1282. Gaber AO, Alloway RR, Bodziak K, Kaplan B, Bunnapradist S. Conversion from twice-daily tacrolimus capsules to once-daily extended-release tacrolimus (LCPT): a phase 2 trial of stable renal transplant recipients. Transplantation. 2013;96(2):191-197. Budde K, Bunnapradist S, Grinyo JM, et al. Novel once-daily extended-release tacrolimus (LCPT) versus twice-daily tacrolimus in de novo kidney transplants: one-year results of Phase III, double-blind, randomized trial. Am J Transplant. 2014;14(12):2796-2806. Tremblay S, Nigro V, Weinberg J, Woodle ES, Alloway RR. A steady-state head-to-head pharmacokinetic comparison of all FK-506 (tacrolimus) formulations (ASTCOFF): An open-label, prospective, randomized, two-arm, three-period crossover study. Am J Transplant. 2017;17(2):432-442. Acknowledgements: The authors have no funding or conflicts of interest to declare. Mario Altieri contributed to patient management, data interpretation, and writing; Guillaume Delaval contributed to data collection and interpretation; Elisabeth Kimmoun, Manon Allaire, and Ephrem Salame contributed to patient management; and Jérôme Dumortier contributed to study concept, data interpretation, and writing.